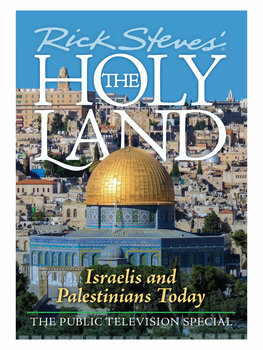 Rick Steves' The Holy Land: Israelis and Palestinians Today — filmed on location in 2013 — is available now as a special "director's cut" DVD. In Israel, Rick travels from the venerable ramparts of Jerusalem to the vibrant modern skyline of Tel Aviv. In Palestine, he harvests olives near Hebron, visits a home in Bethlehem, and pops into a university in Ramallah. Weaving together narratives from both sides, Rick also learns about security walls, disputed settlements, and the persistent challenges facing the region. Why the Holy Land? According to Rick, "I wanted to produce a television show that could help my American viewers better understand this troubled land. My agenda was simply to be balanced and honest. Not with the cold detachment of a news reporter, but with the natural empathy that comes from being a travel writer. I wanted to take on a 'dual narrative' approach: giving voice to reasonable and rational people from both sides of the thorny issues." Director's Cut Bonus Features: An extended version of the original one-hour public television special, commentary track featuring Rick Steves and director Simon Griffith, 15-minute Q&A interview with Rick Steves, and 10 extended interviews with people who appear in the TV special. Bonus DVD: This product is a two-DVD set! The second bonus DVD is the one-hour Rick Steves' Iran public-television special.